GableGotwals has been recognized as a Leading Firm in the areas of Energy and Natural Resources (Band 2), General Commercial Litigation (Band 2) and Corporate/Commercial (Band 3). This is the first time Corporate/Commercial has been named. 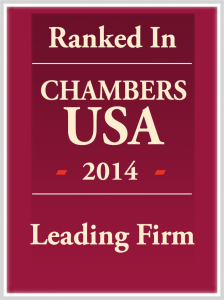 The qualities on which Chambers USA rankings are assessed include technical legal ability, professional conduct, client service, commercial astuteness, diligence, commitment, and other qualities most valued by the client. Interviews are conducted with peers outside of the firm and clients in order to determine inclusion and rankings. What the team is known for: Acts for clients engaged in all areas of the energy and resources market, both inside and outside Oklahoma. Particularly well-respected litigation and environmental regulatory compliance capabilities. Dale Cottingham is a highly respected practitioner, best known for his knowledge of oil and gas and water law. Terry Ragsdale is unanimously acclaimed as “an excellent lawyer in this area.” He is known chiefly for his litigation practice and is engaged on matters not only in Oklahoma but also several other states across the region. What the team is known for: Provides a highly regarded, full litigation service at regional, national and international levels from offices in Oklahoma City and Tulsa. Especially noted for skilled handling of energy sector litigation and a particularly strong appellate law offering. Steven Barghols has long been regarded as one of Oklahoma’s leading practitioners in the alternative dispute resolution space. He focuses on arbitration and mediation, and is also active in the litigation of oil and gas-related matters. David Bryant is characterized as “an excellent lawyer and good, solid litigator.” He represents corporate, government agency and individual clients, and is particularly active in complex disputes in the banking and insurance sectors. Sidney Dunagan attracts praise for providing “one of the best and most knowledgeable services in the area of class actions.” He practices at federal and state level, and is extensively experienced in product and personal liability and oil and gas matters. James Sturdivant has been a GableGotwals litigator for 50 years and has tried numerous cases at both state and federal level. His particular areas of expertise include antitrust, trade regulation and securities issues. What the team is known for: A transactional practice that is expanding beyond its traditional association with the oil and gas industry. Acts for regional, national and international banks, publicly traded companies and healthcare providers. What’s new? A group of lawyers, including healthcare specialist Robert Glass, joined the practice from The Glass Law Firm. Work highlights: Acted for Mid-Con Energy Partners on its $180 million underwritten public offering. Newly arrived shareholder Robert Glass acts on both transactional and contentious matters, and has focused in recent years on the healthcare sector. Significant clients: F&M Bank & Trust Company, IBC Bank, JPMorgan Chase, New Dominion, ONEOK.